From February through July, 2008, COGITO ERGO GEEK presented a series of articles which explored the Wonderland Imaginations of "inventor" and NRA member Todd Lizotte. Essentially, Lizotte envisioned a 'minor change in the production process' where-in unique identification information would be embossed on either the firing pin or the breech-face of a firearm. 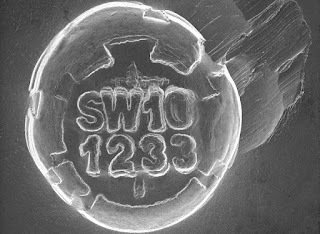 (Which part of the firearm would stamp the code on what part of the cartridge case seems to be subject to interpretation; both alternatives are problematic but the current understanding seems to suggest that the FIRING PIN would stamp unique identifying numbers on the PRIMER." In 2007, "Arnold, the Governator" actually got the California State Assembly (?) to pass a bill requiring that this technology be included in every semautomatic firearm sold in California. There was one provisio, however, which addressed Inventor Lizzotte's patent. Since the inventor stood to make millions in patent rights, the law would not come into effect until the patent had expired. The patent has now expired. Lizotte, for his sins, stands to make no more than 'chump change' from his Grand Idea ... if that. As a consequence, the California law is automatically enacted. California has found the perfect end-run on the Second Amendment. Citizens on California will no longer be able to buy new semi-automatic pistols at 'reasonable prices', which hurts all but the most affluent of Californians. Yes, this law is directly targeted to discomfort all but the very rich. Henry Ford became one of the richest men in America early in the 20th Century when he proved the benefits of Mass Production. Make every part identical to every other part, and assemblers may build the most complex machinery by just dipping a hand into a bucket of each part. The parts are all made to the same specification, so they will all fit perfectly. Before, machines were made mostly by hand, with each part hand-fitted (filed until it fit) to match the abutting parts. This was hand-labor, and Ford successfully replaced it with machine-labor. Lizotte's brainstorm, however, takes us back to the cottage industry era where 'some' individual parts must legally be matched with 'other' individual parts. In this case, there are two alternatives of unique parts which must match. The Serial Number of each firearm is typically stamped, embossed or engraved on the receiver of each firearm. In a pistol, that is the Frame. All other parts may be replaced without need for registration or AFT tracking, but The Frame is The Gun. Until this time, both manufacturers and repairmen (gunsmiths) could interchange any other individual parts with the Frame, and it would remain the same firearm. With the new California, there is another Unique Part: Depending on the wording of the law, either the Firing Pin or the Breach Block (eg: the breech face of the slide, in most semi-automatic pistols) must be be constructed so that when the firearm is fired, the unique coding number is impressed by the force of recoil on some part of the cartridge. That is to say, the unique code is MICROSTAMPED on the cartridge. For the sake of discussion, let us assume that the unique code is part of the firing pin, rather than the breech face of the slide. When the pistol is fired, the slide retracts and at the same time the initial striking force of the firing pin is magnified by the action/reaction effect. This provides sufficient energy to emboss that code on the firing pin. The cartridge is ejected, and if it is left at the scene of a crime it may be examined to determine the make, model and serial number of the pistol which fired it. This information would allow Crime Scene Investigators to access a DataBase which matches each unique identifier ... that information may not actually be embossed on the cartridge primer ... which would lead to federal records identifying the original purchaser of the firearm. Which, logically, would identify the perpetrator of the crime. This is the "Logic of Lizzotte". Alternatively, if the unique identifier were engraved on the breech face of the slide, then the unique identifier would be embossed (micro-stamped) on the base of the cartridge, with essentially the same effect; it would be possible to identify the firearm which ejected the cartridge, and therefore to track the owner of the firearm. If the firing pin or the slide must match the serial number of the frame, then that second part must also become an inventory item; it must be recorded. If the recorded part must be hand-fitted to the frame, it can no longer be randomly plucked from a bucket of identical parts. This takes the manufacturing process from the "interchangeable parts" process of modern industry to the "hand fitted" cottage industry of the 19th century ... and that is very, very expensive. Firearms, like all machinery, are subject to wear and destruction during their usage. If a slide or a firing pin must be replaced, it is currently a relatively minor process easily performed by any competent gunsmith -- or often by the gun-owner at a relatively small cost. However, if the replacement part must contain the micro-stamping element, each part must be individually made. Firing pins are a few dollars each; slides are several hundred dollars each. Matching the encoding on a serialized frame requires special and unique manufacturing processes. It also requires governmental oversight to ensure that the replacement part encoding matches the serial number on the frame. This is, again, "cottage industry" processing. The government must provide oversight to ensure that the parts match. It must also maintain a registry of original parts, plus replacement parts, along with a mechanism for tracking. This is tantamount to registration. It is also very expensive. Parts might be available from foreign sources, which are not required to accommodate the laws of a single state, or those of a single country. It would be easy to buy these parts. Yes, they would be more expensive (market demand) but less expensive than those which are controlled by the government. Skipping the next two or more logical objections; this is a concept which has so many procedural loop-holes that it would be impossible to control the production, importation and replacement of parts which are suppose to be damaged or broken. Honest people might try to accommodate the legal requirements, but it would be a hugely expensive process in terms of time, effort and money. Dishonest people would find a way around it: file off or fill the Micro-Stamping on the firing pin, or the slide breech face; find parts which do not carry the Micro-Stamping features. In fact, in sheer frustration, even honest people would be inclined to substitute (for example) a $3 firing pin of no pedigree whatever for a $300 firing pin with the legally required Micro-Stamping. This law, this process, this concept ... is not a 'crime stopping' measure at all. It is merely one more lame (albeit elegant) method by which local entities might logically impose draconian regulations on firearms ownership. These state-wide legal requirements would be so expensive for firearms manufacturers that no large-scale manufacturer would attempt to meet them. It would increase the consumer cost from twice to ten-fold, or better, for each firearm. It constitutes an embargo on the purchase of new firearms. This would accelerate the Black Market of 'new' firearms, which would be purchased out-of-state and sold as "used" ... which would make criminals of honest citizens who only want to receive a reasonable value for their money; and at the drastically inflated of 'legitimate' new firearms, illegal firearms would become more attractive. The expense of supporting this quasi-registration would be disastrously expensive for the government. .. which leads directly to Confiscation. Does anyone doubt it? Governmental controls of replacement parts would required an entirely new level of Governmental Regulation and Control ... and that's expensive to every taxpayer in the state! It wouldn't work. Stolen brass, stolen guns, stolen parts ... criminals intent on firearms violence would easily obfuscate law-enforcement efforts by leaving false clues. Only Honest Citizens would be hampered by this new law. Surely, someone in the state of California must realize that this is a 'feel good' law which will only serve the cause of Gun Control, not of Crime Detection. Oh, wait! I forgot .. this is California.